We’ve reached the end of the work week again: it’s Friday, August 10, 2018, National S’Mores Day: a homemade comestible produced only, I believe in the U.S. and perhaps Canada. Go to the link if you want to see it. 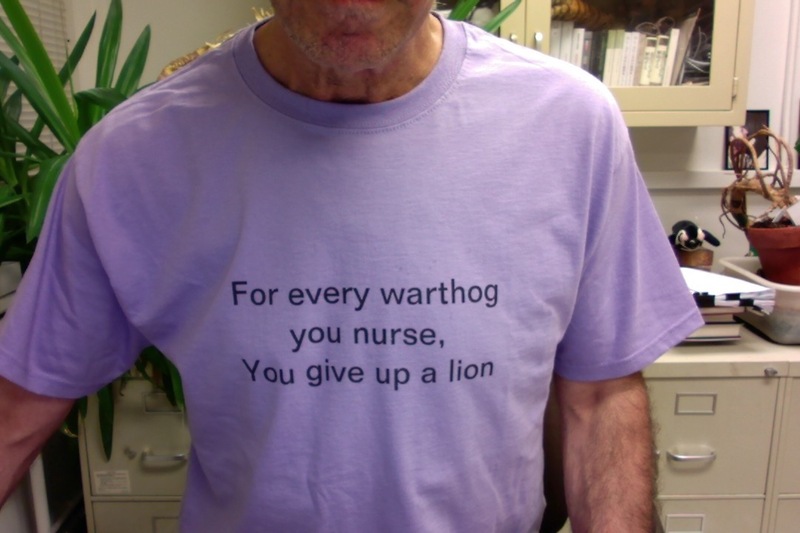 And believe me, if somebody gave me one or three now, I’d scarf them down. It’s also International Biodiesel Day, celebrating Rudolf Diesel’s first such engine started up on August 10, 1893, and running on peanut oil. In other news, we still have two ducks: Honey and her timorous daughter Phoebe. The good news is that the two have sort of reconciled and are foraging together, with Honey only occasionally pecking a bit at Phoebe at feeding time. Both are well fed, and Honey’s flight feathers are growing fast. Wings crossed that they’ll both leave in good condition, but not too soon. . . Finally, reader Paul informs me that Steve Pinker will be on Bill Maher’s show tonight. I don’t get cable, but I’ll post any clips that appear on YouTube. On this day in 1519, the five ships under command of Ferdinand Magellan sailed from Seville to circumnavigate the Earth. Magellan was killed in the Philippines, but one ship made it back, arriving in Spain on September 6, 1522—more than three years after departure. About 270 sailors had set out; of these, 232 died. A penguin was named after Magellan. On this day in 1628, the Swedish warship Vasa sank in Stockholm harbor, only 20 minutes into her maiden voyage. 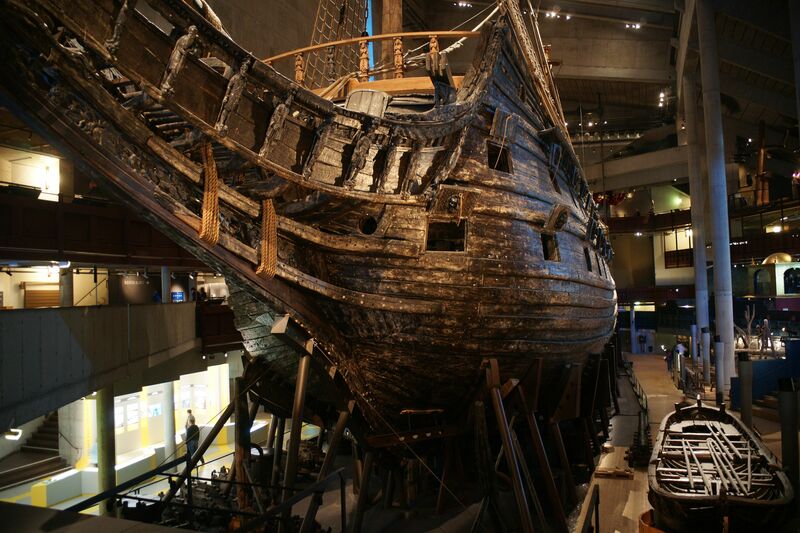 The ship was raised in good condition in 1961, and, after restoration, is now on display in Stockholm. It’s an amazing sight; go see it if you’re in that lovely city. Here’s a view of the bow from Wikipedia. On August 10, 1675, construction began on the Royal Greenwich Observatory near London. And in 1793, the Musée du Louvre was officially opened in Paris. On this day in 1948, the television show Candid Camera made its television debut. Does anybody remember it—and its creepy host Allen Funt? On August 10, 1969, one day after the Manson gang murdered Sharon Tate and four others in Los Angeles, they killed Leno and Rosemary LaBianca. More crime news: on this day in 1977, the 24 year old David Berkowitz (“Son of Sam”) was arrested for a series of 8 murders in the New York City area over one year. Notables born on this day include Henri “Chocolate” Nestlé (1814), Herbert Hoover (1874), Nobel Laureate Arne Tiselius (1902), another laureate, Wolfgang Paul (1913, not “Pauli”), Jimmy Dean (1928), Eddie Fisher (1928) and Rosanna Arquette (1959). Those who died on this day include Rin Tin Tin (1932; d*g), and Isaac Hayes (2008). This is just a nice absurdity. Sometimes you are looking around and you have a feeling that something is missing: a fork on the table, a chair which normally is in the room, etc. But you can’t really place what it is you are missing. 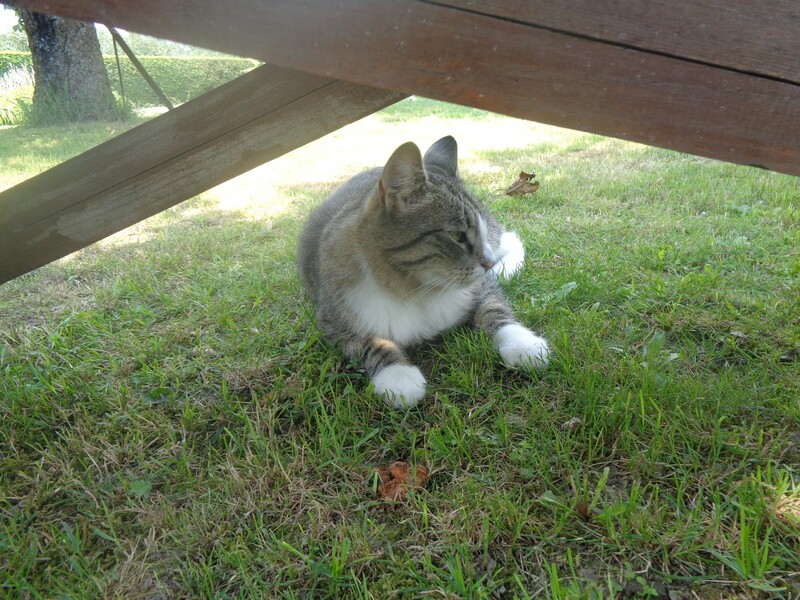 Now, Hili is outside and she says that she has this feeling. Instead of trying to guess what it is she is missing, practical Hili says that she will know it when it comes and she sees it. Hili: Something is missing here. Hili: I don’t know, but I will let you know when it comes. Hili: Nie wiem, zobaczę jak przyjdzie. Bookstore cats are the best cats! (Be sure to watch the video.) Hongkees (the name some from Hong Kong call themselves) love their cats! Another owl, also from Matthew But as you may know, owls have long been Honorary Cats™ on this site. This entry was written by whyevolutionistrue and posted on August 10, 2018 at 7:00 am and filed under Hili Dialogue. Bookmark the permalink. Follow any comments here with the RSS feed for this post. Both comments and trackbacks are currently closed. I didn’t even go there – I went through yesterday thinking it was the 10th. They called a penguin Ferdianand? John Lennon saw a beetle walking across the floor and said, “Hey little beetle, we named a famous band after you”. The beetle looked up and said, “You called your band Eric?”. When they raised Wasa in 1961, they found a miniature statue of Paavo Nurmi inside. It was slightly baffling, as the runner was born about 269 years after the boat sank. Apparently some Finnish students had dived in the night before and placed the statue. There is allegedly a sticker from a Bristol caving club on an interior surface of the Huygens lander on Titan. Personally, I’d blame the Mendip Beer Monster myself. Motive (people don’t get nicknames like the Mendip Beer Monster without good reason ; Mendip does not have a Beer Monster shortage – it’s the cider) ; method – many a “discovery” underground has been spoiled by the discovery of a discretely-placed “Bristol Exploration Club” marker, which translates to “we found this first, and we’re still exploring, so go find your own cave” ; and opportunity (there are BEC members working in aerospace). Plus, it’s exactly the sort of idea he’d come up with, in between rounds of sofa rugby. … one ship [of five] made it back … more than three years after departure. About 270 sailors had set out; of these, 232 died. And almost nobody knows the names of anybody on board that one ship even though it was the first one to circumnavigate the globe. Their fault for no havin’ a weblog. Remember the show Candid Camera and the strange guy Allen Funt, but did not know it was that old. It was a gag show with a hidden camera. Early days experimenting with television I think. Candid Camera — “Punked” avant la lettre. It is interesting that the circumnavigation of the Earth by some of the Magellan crew happened by accident; it was not planned. The goal of the expedition was to reach the Moluccas (economically important because of the cloves) and re-cross the Pacific to return to Spain, thus avoiding traveling through territories claimed by Portugal (Charles I/V did not want to have problems with the king of Portugal, I think they were brothers in law or similar). After several misadventures, the remaining members of the expedition were imprisoned by the Portuguese somewhere in the Indonesian archipelago and when released they went back to Spain by the shortest way, thus completing a never intended circumnavigation. “It’s French, but it hasn’t surrendered yet,” is what an Englishman lookin’ for some McVitie’s payback might say. When I was in college, I used to bowl regularly at an alley in Yonkers, New York. It had a ball cleaning machine. One day I saw that standing next to the machine was a wooden booth with the side facing the machine having a small glass window. Also, the area surrounding the machine was suddenly brightly lit. I suspected at the time that this was a Candid Camera stunt. It turned out that when a ball was put in the machine for washing, it came out broken. I don’t remember how they switched the good ball for the broken one. The idea was to film the reaction of the ball owner. Back in those days, TV wasn’t all that sophisticated. It wasn’t called the Royal Greenwich Observatory whilst it was at Greenwich. It was the Royal Observatory. Only when it moved to Herstmonceux Castle in Sussex in the late 1940s was it renamed the Royal Greenwich Observatory, as a reminder of its long history at Greenwich. It moved to Cambridge in 1990 and retained the RGO name, but it ceased to exist on 31 October 1998 when it was closed by the British government. The site at Greenwich is a museum and is called the Royal Observatory Greenwich. You’ll excuse me if I stress the point, but I was a member of staff at the Royal Greenwich Observatory in its final years in Cambridge, and I was there on the morning of its last day as an active research observatory, when the Director lowered the Union Flag for the final time. It must have been a very poignant moment when the flag was lowered. A sad end to 323 years of our national observatory. Why did the government close it? Juan Sebastian Elcano finished the voyage. The motto over the globe on his coat of arms was Primus circumdedisti me (“You went around me first”). He gave his name to a Spanish gunboat, which was captured at Manila, and taken into service as the USS Elcano. She served with the Yangtze Patrol until 1928. And yes, the joke’s on me. Many of those artists are greatly admired by the French. McVities is a British company. It’s possible that the slogan is a piece of the self deprecating wit that we Bits used to be famous for. Bits and peaces, how the mighty has Brexit! Or maybe those cats at Cahiers du Cinéma were just pullin’ our legs when they said Jerry Lewis was better than Chaplin and Keaton and Harold Lloyd. In Stockholm, I always chose McVitie’s digestiv cookies were the clear winner over local brands, as the occasional taste comparison would tell. And Happy Birthday Herbert Hoover! And if someone actually asks you what your t-shirt means, I don’t think you’d be able to explain it without the lengthy explanation you gave. I guess you could just say: “evolution joke”, and leave them puzzled…even if the person knew a lot about evolution! “Smile, you’re on Candid Camera!” Yes, I remember it. That was Funt’s “cap” line, hollered just before the victim is about to freak out. Funt comes out of hiding, revealing the hoax, much to the relief of the poor subject as Funt outlines the sordid details. Off camera, the victims all sign releases and much later get to watch themselves on TV. Presumably, they’re paid well for making fools of themselves on the “hidden” camera. Well, folks, it was the “sixties”. TV was still a novelty and people would watch anything. I view Candid Camera as the forerunner of all the stupid “competition” shows on TV today: anything from singing to acrobatics. Funt was the father of it all.